Yours brakes are the only components that will effectively slow you down your car. Brake pads need to be checked on a regularly and if you are driving with a worn pair, your stopping distance will increase thus increases your chances of an accident. The best brake pads are the ACDelco 171-1010 GM OEM pads that are proven to reduce brake harshness, noise and vibration. They are available in various different sizes to fit a range of vehicles. When it comes to replacing your brake pads, there are several options to choose from depending upon your budget. From semi-metallic to ceramic brake pads, there is a range to choose from depending on your cars usage and preferences. The average car owner may think that all brake pads are the same but this is not the case. Some are designed to increase stopping power in performance related cars whilst others reduce noise and vibrations for additional comfort. Brake pad dust is another major factor when it comes to buying your replacement brake pads. Constantly seeing black brake dust on your wheels is not great and choosing a higher quality brake pad for your car can make all the difference. You should expect around 20,000 from a set of pads but this varies by the type of driving you do because they will wear more for city rather than highway driving. Below is a list of the best brake pads for performance and everyday driving. ACDelco are one of the best brake pad brands with a range of performance to budget brake pads available. The 171-1010 pads are designed for performance with a premium construction, which is required for performance vehicles. Overall, the ACDelco 171-1010 are the best performance brake pads that are an OEM replacement. Many performance pads may require you to upgrade other components of your braking system, which can be fairly costly. Purchasing these will skip that step and also be far cheaper than the dealership prices. The EBC 7000 Series Greenstuff brake pads are designed for Trucks and SUV’s that need more stopping power. They are a sport replacement for OEM brake pads with a more performance related solution for the extra stopping power and reduced amount of brake dust. There are not many brake manufacturers that provide a lifetime warranty with the brakes. However, EBC are confident of their pads and they are the best brake pads for trucks available. As you can imagine, trucks are heavier and it takes more power to stop them, therefore its worthwhile investing into pads that are suited for large vehicles such as these. For those that are serious about towing, you would have already installed a trailer brake controller. However, you can go a step further with the best brake pads for towing, which are these Power Stop Z36 pads. With reduced fade and more stopping power, these will improve your towing abilities and safety. StopTech are part of the Centric Parts brand that provide high performance brake pads for race cars. These brake pads are designed for spirited street and light track use and are a cheaper alternative to the ACDelco listed above. The StopTech brake pads are a cheaper alternative to OEM and the premium alternatives that are designed for performance. Akebono are another popular car brakes brand in the US and these ceramic brake pads have been designed for both performance and affordability. Akebono claim that their pads are designed formulations for each vehicle model, which is highly impressive for a relatively cheap brake pad set. Overall, these brake pads are excellent all-rounders and are used as the original equipment for most domestic and Japanese vehicles. At a low cost with OEM qualities, these brake pads are an excellent replacement set for your car. Ceramic brake pads are known for being fairly expensive but Wagner have developed these more affordable alternatives. As you can see from the ThermoQuiet branding, these pads are known for their low noise output with Wagner claiming that they are 35% quieter than alternatives. The ThermoQuiet series by Wagner are very popular throughout the US and available for the majority of vehicles on the road. Overall, they are the best ceramic brake pads for the money and are designed to fit and perform the same as OEM parts. Replacing your brake pads is a relatively simple mechanical job that you can do on your car. There is a range of brake pads available for every type of vehicle but finding the best option can be fairly difficult. Everyone has different requirements from wanting to increase stopping power to reducing noise. The recommended brake pads above should provide insights to what is available for your vehicle. When it comes to the braking system of your car, all the components need to be fully functioning. Worn components will increase the stopping distance and could potentially be the direct cause of an accident. 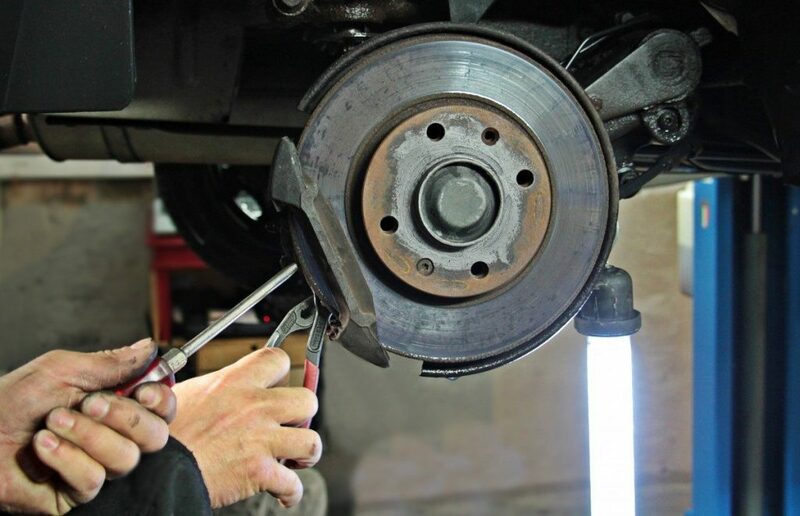 Therefore, it is crucial to pay close attention to the health of the brakes with the pads being the component that requires frequent replacement. Some car owners will get their brakes pads changed as soon as the warning sensor appears. 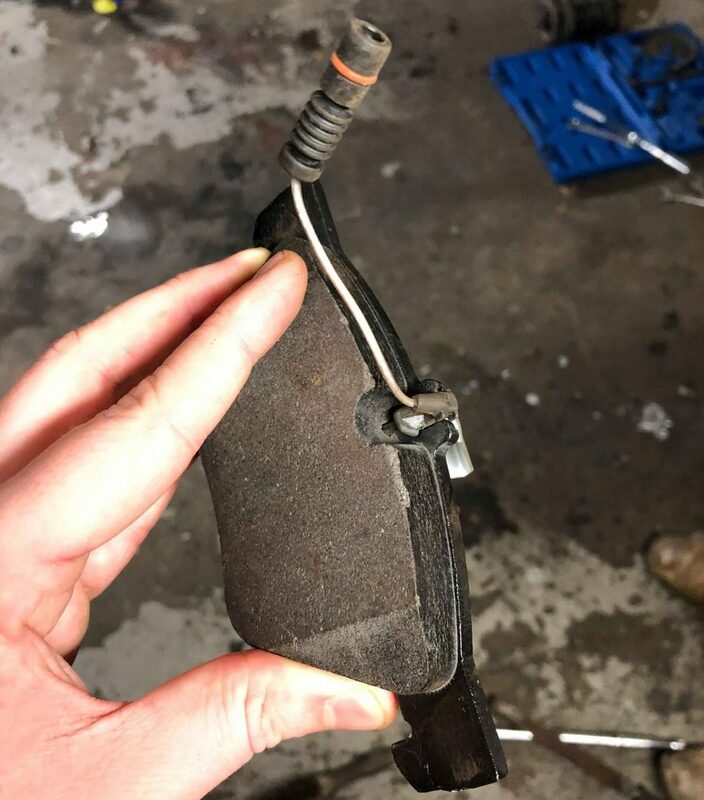 This is advisable but if you ever feel that your brake pads are not performing as they should, you should get them checked out as soon as possible. Below is an example of some front brake pads that were changed on my friends car due to them claiming a “metal on metal” noise. As you can see, they certainly got value from these pads but the car was simply dangerous when the brakes were used. This is as expected and we highly advise that you do not let yours brake pads get to this stage. Brake pads can be constructed with a range of materials that produce a range of benefits and drawbacks. The buying guide below will enable you to make a more informed decision when it comes down to buying brake pads for your cars. Depending upon the type of car you own and the performance that you want to achieve, there is a range of types to choose from. The majority of stock vehicles on the road that are built for the “average” car owner will use semi metallic brake pads. These are widely used due to their low cost and are made from a mixture of steel wire, graphite, copper and friction modifiers. Benefits other than the affordability include durability and they are effective at transferring heat. However, they are known for producing an increase in noise, wearing down your brake rotors faster and not being as effective in cold temperatures. Non asbestos organic brake pads are often referred to as (NAO Pads) are made from fibers, high temperature resins and other filler materials. If you are looking for quiet brake pad setup, opting for this type of pad is highly advised. Other benefits of include the fact that they are softer, which avoids rotor wear but this does have a drawback. They are known to wear down much quicker with the addition of further brake pad dust. Therefore, you may find yourself using wheel cleaner more often. Low metallic NAO brake pads are a mixture of the two types above. They are made of organic materials with the addition of 10 to 30% metal depending upon the brake manufacturer as they do differ from brand to brand. These will be slightly more expensive but they provide the best of both worlds. The final type of brakes pads are the performance based ceramic pads. These are the most expensive but provide the best results in terms of performance, producing low noise and dust and doing as little damage to the rotors. They are constructed from ceramic fibers, bonding agents and filler materials and are found on most performance or sports cars. The purpose of a wear indicator is to provide a signal to the vehicles computer that the brake have reached their limit and need to be changed. Of course, you can probably drive several miles with this indicator but its advised to get them sorted as soon as possible. There are many different types of wear indicators that include electrical, position sensor, ocular and a mechanical plate that is embedded into the pad. The electrical wear indicator is the most common and it will send a signal to the instrument cluster once the embedded part in the pad comes in contact with the rotor. Above you can see the construction of the brake pad wear indicator and they do become damaged overtime. However, not everyone will change their sensor each brake pad change as it can be time consuming in some cases. It is quite hard to tell from looking at your car whether or not the brake pads require replacing. Therefore if you have the following symptoms, you should look into changing your brake pads. Brakes Warning Sensor. If this light has appeared upon your instrument cluster, this is a clear sign that you need to replace yours brake pads. Car Pulling to Left or Right. This often indicates that the brake pads have worn out unevenly, which causes car to pull to one side or another. However this could indicate other issues with the car. Always replace brake pads in pairs. Metal on Metal Grinding Noise. If you feel and hear metal on metal noise, you will need to replace the brake pads and the brake calipers immediately as this will effect stopping distance dramatically. Clicking and Screech Noise. If you hear a clicking noise when presses the brake pedal, this indicates the brake pads need replacing. A screeching noise may also be heard that is high pitched from metal on metal. Look at the Brakes. If you are worried, simply look at the brake pads. They should have plenty of meat as per the image below. I replaced the brake pads on the car below after the customer experienced metal on metal noise and sensation. They sure did get their money’s worth from those brake pads! The majority of cars require that the brake rotors need replacing when they reach 10mm however some manufacturers specify other limits. Brake pads should be changed at the same time as new rotors are fitted. If there are grooves in the brake disc, this reduces the amount of contact that the brake pad will have and will increase the stopping distance. Expect to replace the brake rotor on every second or third brake pad replacement. You will often hear cars have squeaky brakes, which does not always mean they need replacing. Squeaky brakes can be fixed by applying brake grease to the back of the brake pad (not the front or rotor), which prevent the squeaky noise from the caliper piston pressing against the brake pads. If you have purchased the best brake rotors and are then fitting budget brake pads, you will want to rethink your process. Many rotors will require specific brake pads to perform as expected. 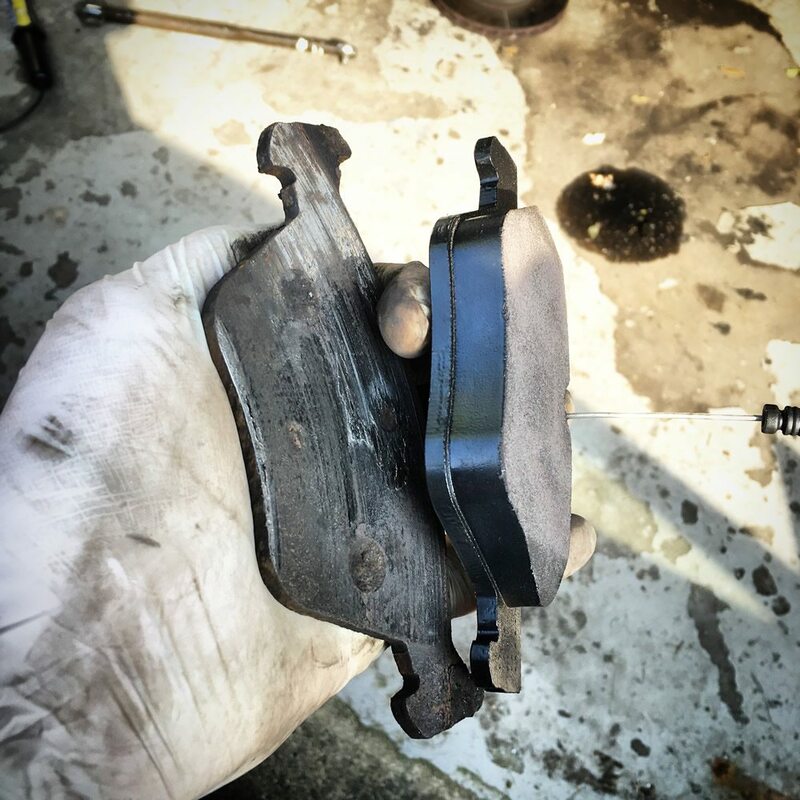 Replacing your old brake pads with brand new pads isn’t that hard of a task to accomplish. To change a cars brake pads you will need a jack or lift, brake pad spreader, grease, wheel nut socket, wrench and of course the new brake pads. Some brake pad setups may differ but you can use the below as a brief guide to replacing your brake pads. The brake pads will take a number of miles to fully bed into the rotors. It’s vital to take your first drive carefully and get used to the new brake pads. If you require a more in depth video tutorial, we recommend watching this excellent video. When it comes to choosing brakes pads for towing or for larger SUVs and trucks, you must opt for a heavy duty option. This is due to the extra power required to slow down the far heavier vehicle. If you were to use standard passenger car brakes, you can expect far greater stopping distance and fading of the brakes. Most heavy duty pads are a metallic or ceramic type of brake. This is thanks to their durable qualities compared with an organic type, which are more softer and wear more quickly. Of course, some trucks are far larger than others and many people may have a large truck along with a fifth wheel hitch, therefore you should be choosing very durable brake pads. Base your pad selection upon the type of usage that your vehicle will be doing. When it comes to the braking of your car, cost cutting should not be the first thing on your mind. Opting for aftermarket brake pads that do not match OEM standards can result in poor performance, more noise and more brake dust. However, you may not be in the position to spend a large amount on performance brake pads, which is understandable. All of our recommendations cover a range of budgets along with different types of performance capabilities. Dan is an automotive journalist and owner of over 10 cars ranging from supercars, luxury modern cars, classics and your good old beater cars. He always like to get his hands dirty with nut and bolt restorations and detailing sessions with the latest products. Feel free to read more about our team. Keep up to date with all our news, recommendations and updates. Within some of our articles, ProCarReviews may direct you to retailers, which may provide us with a small commission on any sales. This comes at no extra cost to you and does not affect our opinions on product quality. You can read more via our affiliate disclosure.